Ok My wife and I have tired of fighting with the portable GH to keep it up right and have decided it is time to move to a more permant solution. But am not opposed to 4 or 6 mil plastic sheating to keep costs down can allways add the poly a little at a time as money frees up and still be functioning in the mean time. Thoughts on the plastic sheeting are 2 layers one over the frame and one inside the frame so there is a 4 inch air space between the two layers any thoughs??? also will a single slope roof be fine or am I better of with a peaked or arched roof. Any and all sugjestions will be appreciated Just want the best possible out come over time on a budget. all i can say is look into passive solar greenhouses. you will be much happier with the end results. also you might want to check out the subterranian heating and cooling thread here in the greenhouse forum. Accually used missouri university's web site since there info is applicable to my climate. Here is the link I used Incase anyone needs an indepth explaanation and plans on a sample one they built. Any how If you have more info or a better (More ecconomical) set of plans please let me know 3 grand is a bit out of my price range..
you don't need plans to make a solar greenhouse. you just need to know the principles and apply them to your area in the way that suits you best. they could be made from wood, concrete, rammed earth, cob, sandbags, all kinds of materials. 12 X12 will be a great size. Good luck, my first one was plastic covered the first year. Last edited by bogydave on Wed May 04, 2011 12:56 am, edited 1 time in total. My husband bought me a Rion Greenhouse. It is 8.5 W x 25 L and we are almost finish building it. I will have plenty of room to play definitely. w.
I built a 12x16 a couple of years ago and spent less than $700. Used 4x4 posts for the corners and center, 2x4 in between. The top was 13 mil, fiberglass reinforced plastic, the inside layer for both the top and three sides was 4-mill IRAC greenhouse plastic. Got lucky and found glass windows for the front and part of the sides, as well as a glass door. The back (north wall) is OCB board with insulation is the base around the rest of it. I lined the back wall with Mylar, installed a couple of electrical outlets and a switch for lights. Also added a remote thermometer so I can keep track of the temps. My best laid plans went astray when the winter sun drought hit and we went six weeks with very little light. It was not economically feasible to both heat and light it, at least not enough to grow tomatoes and such. But this year, I'm using it to raise seedlings in and it works great. One thing I learned the very hard way - make sure you install some kind of automatic vent unless you will always be around to check the temps and open or close doors/vents. It can go from cloudy with temps in the mid-40s to bright and sunny with temps in the mid-50s in a couple of hours. But inside a GH, the temp can hit triple digits - mine got up to 125 one day and I had fried tomatoes! Could you attach it to your house or be somewhat close? If you don't want to go the subterranean route, you could at least heat your living quarters. Really don't see ow it would be possible to attach it to the house... Unless and I am open for sugjestions we are looking at putting a large screened deck of our back door the south side of our mobile home. Could encase it with plastic in stead of screen but how would you keep the cold from coming through the deck floor? Could encase it with plastic in stead of screen but how would you keep the cold from coming through the deck floor? Ridged insulation on the underside. Fiberglass would get wet / moldy and loss it R value. If this is a sun room, maybe you lay down a plywood sub floor and tile. If there's a will there's a way, but it could get expensive. Thanks for Some good info on the solar greenhouse and phase change material! I plan on something simple but should work great! I am going to have several base board water heaters that will be connected to a set of 5 -50 gallon drums. A syphon hose connnected to each drum will move the water from the main one that is connected to the baseboard heaters! One drum will have water comin in and one will have water sucked by the pump so all will be moving the water! The base board heater finns will collect the heat from the greenhouse during the day and a small pump will pump the heated water into the drums! I figure the drums will gain 10 or more degrees during the day with the heaters absorbing the heat fast.. If I can find some radiators I will use them in the system also! +++My extra heat source of a 10 gallon electric water heater will be mainly for the sweat chamber!. If I can keep my solar greenhouse above 40 all winter I will do great! Bobberman wrote: The base board heater finns will collect the heat from the greenhouse during the day and a small pump will pump the heated water into the drums! I figure the drums will gain 10 or more degrees during the day with the heaters absorbing the heat fast.. It can be done in reverse. The pump acts as you heat transfer agent! A radiator works the same way. Our home has radiator heat and is cool in the summer because our baement is cool. A radiator can also work by graviety flow so if a basement pump is not turned on there will stil be some water movement of warmer water.! The fin in the baseboard heater heats quick to the temp of the greenhouse and the circulating water from the pump carries the heat into the drums. The drum water will never get warmer than the temp of the greenhose during the day but only higher than the low night tem.! This sypstem will even cool the greenhouse some during the day! The pumps can be set to run at night when a low temp is reached to put some heat back into the greenhouse plus the drums will give off heat at night also without the pumps!Thanks for that good question or debate but I think in this case I am right but would like more input! ! Are you going to be using artificial lighting in your GH? I'm not that far from you but we go through a sun drought from the middle of December until early February. If you are raising low-light plants, they may do okay, but sun-loving plants will just sit there, getting leggy. 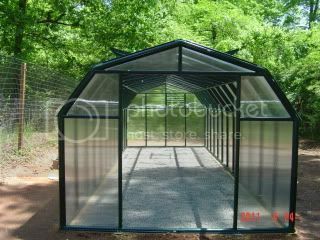 Heating a small solar greenhouse ideas!